For people or businesses considering filing for bankruptcy, a bankruptcy appraiser can help determine the actual value of owned property. A certified appraiser considers the fair market value of all property and will provide a copy of their findings to a bankruptcy court. A bankruptcy appraiser decides the value and authenticity of art, antiques, jewelry and other items of an estate. They decide upon the wholesale value of a particular item by comparing it to other items of equal value and then report their findings to the court. An appraiser may travel to an estate to determine values, or items may be dropped off at an appraiser's place of business for value determination. How Much Should an Antique Appraisal Cost? An appraiser receives both on the job training and depending on the area of expertise, additional certifications. Fine art appraisers usually have a bachelor's degree in fine arts. 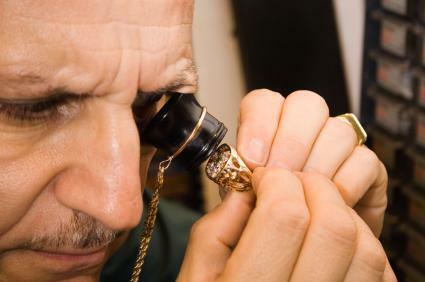 Those that appraise gemstones and jewelry will have a certification from the Gemological Institute of America. Estate appraisers may hold a real estate license. Certifications are not necessary, since most appraisers learn their skills from working closely with appraising professionals. A bankruptcy appraiser may work for a law firm, an appraisal business or for themselves. After they have received enough training in their area of expertise, many appraisers choose to contract themselves out for appraisal jobs so that they may set their own hours and wages. Entry-level appraisers can expect to earn around $20,000 per year. Experienced appraisers can expect to earn $40,000 or more, depending upon their area of expertise. Many individuals who are going through a bankruptcy are concerned about the bankruptcy appraisal process. They may be worried that they will be "taken to the cleaners" and have their property undervalued. An appraiser will always compare the property being assessed to other same or similar items of equal value to determine the proper values. It is in the property owner's best interest, as well as the appraisers, to correctly value property. An appraiser that is found to have incorrectly valued items on a regular basis may be subject to legal action as well as lose their business and credibility. A bankruptcy appraisal, depending on the size of an estate, may take several weeks to complete, depending upon the number of appraisers required. Since most appraisers are specialists in a given area, this would explain why the final appraisal might take a long time to complete. If an individual or business files for bankruptcy, they can expect their assets to be evaluated for value. Appraisers will determine the values of various items and property and provide it to the lawyers involved in the bankruptcy proceedings. A bankruptcy appraiser will not be involved in discharging the debts of the estate, including student loans, credit card accounts, retail charge cards, unsecured loans, taxes, child support and alimony. After an appraiser has determined the value of your property, depending upon the state in which you live, your possessions may or may not be seized by the government. Each state varies on the dollar amount of each type of possession you may continue to own, which usually includes a wildcard allowance that a property owner may use for any type of property that they choose. The law firm that you hire usually chooses the appraisers that will determine the value of your property. The individuals that do an appraisal during a bankruptcy are experienced and will provide the most accurate information to the court. Appraisers with experience will train a bankruptcy appraiser, and occasionally they will receive additional training through college courses or certification courses in their area of expertise.